Senior designated hitter Elijah Skipps powered the Cal Poly baseball team to victory over UC Davis Saturday, April 14 but couldn’t complete the sweep Sunday. This is the first time this season the Mustangs hosted a home series against another Big West team as well as the first time they won a conference series this year. Cal Poly clinched the series with a 7-4 win in Saturday night’s game against UC Davis behind strong performances from Skipps and junior relief pitcher Cam Schneider. The Mustangs scored early with a two-RBI triple by sophomore second baseman Scott Ogrin to put the team up 2-0. UC Davis closed the gap with an RBI double, but an inning later Skipps stretched the lead with a grand slam to put the Mustangs up 6-1. The grand slam is Skipps’ first home run of the year. He also recorded his first hit of the season earlier in the game and finished the night 3 for 3 with four RBIs and two runs. “I’ve been out a while so it’s nice to get back in the swing of things and luckily I got a few hits,” Skipps said. Cal Poly’s pitching held strong throughout the first five innings as senior starting pitcher Trent Shelton turned in a quality start, giving up only one run. In the top of the sixth, however, Shelton ran into trouble, giving up a home run, an RBI double and let two men on base while failing to record an out. Schneider took over for Shelton and pitched the last four innings, striking out five and allowing only one inherited runner to score on a groundout in the sixth. 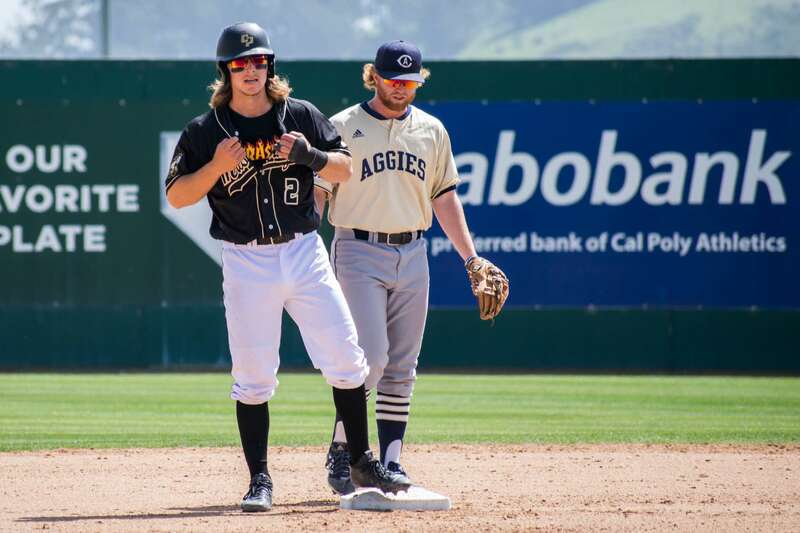 Despite a strong early showing at the plate, the Cal Poly baseball team lost 16-10 and was unable to sweep the Aggies. The Mustangs’ bats got off to a hot start, knocking in 10 runs in the first three innings, but cooled quickly and were unable to drive in another run for the remainder of the game. The team scattered hits throughout the final six frames, but never strung any hits together. Several Mustangs had great performances in the loss. Senior designated hitter Elijah Skipps recorded his fourth hit and second home run of the season, and the series, with a two RBI shot while sophomore second baseman Scott Ogrin hit three straight doubles and scored twice. The pitching staff had a tough day as UC Davis tore them apart. After two solid innings in which the Aggies only scored one run, the Mustangs pitchers gave up eight runs in the third, allowing UC Davis to take the lead. The Mustangs answered with 5 runs of their own in the bottom of the third and left the inning with a one run lead, but Cal Poly could not solve their pitching issues and gave up six more runs to put the game out of reach. While the Mustangs lost the game, they still won the series and three of their last four games. Head coach Larry Lee entered today with 499 wins with the Mustangs and will continue to look for win 500 at Pepperdine Tuesday.